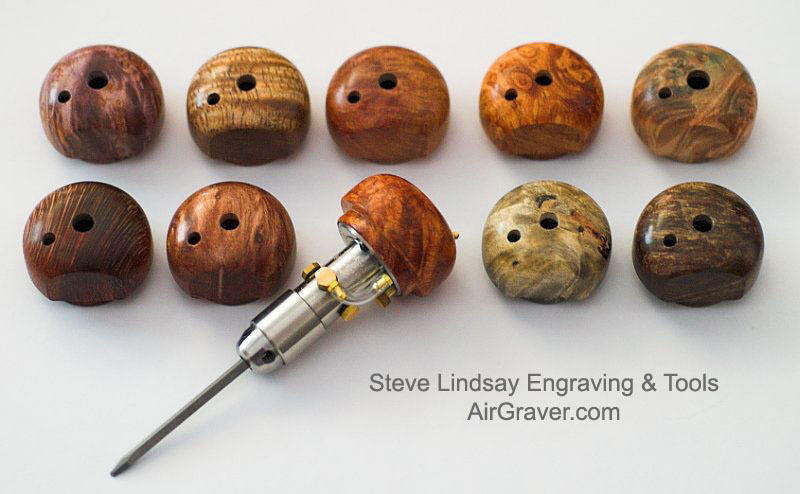 PalmControls with optional custom stabilized burl wood handles. The PalmControl® handle is placed on a Classic or Artisan handpiece to provide superior impacting control without a foot pedal. 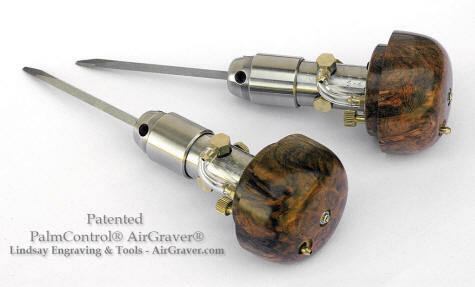 It utilizes hand pressure to hold a graver in a cut to vary and control the impacting power of the tool automatically. 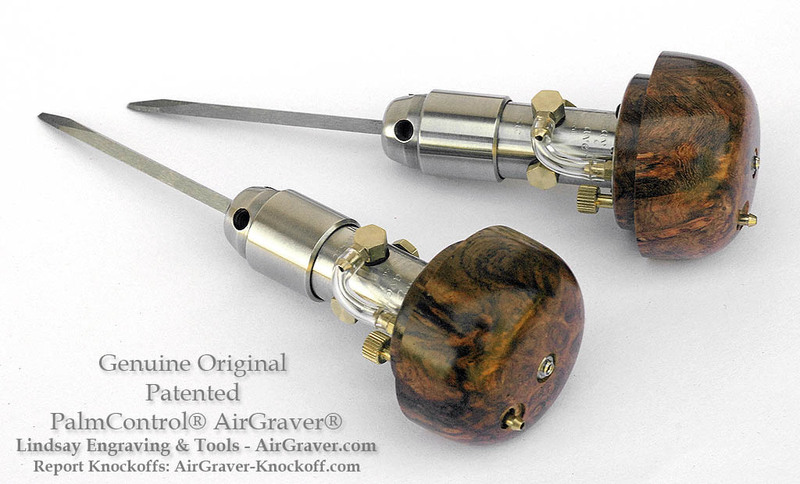 The patented tool is like engraving with a traditional palm push graver only the user does not have to push as hard. If a person is used to foot pedal engraving, a few minutes with the PalmControl® is all it takes for the improved responsiveness to be realized. The hand is more sensitive than the foot, and is capable of subtle corrections. 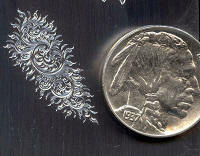 F or the professional or the beginner, it is intuitive, faster, and makes the engraving process easier. The tool is capable of producing an enormous range of cuts, from fine banknote-style engraving to removing heavy background. 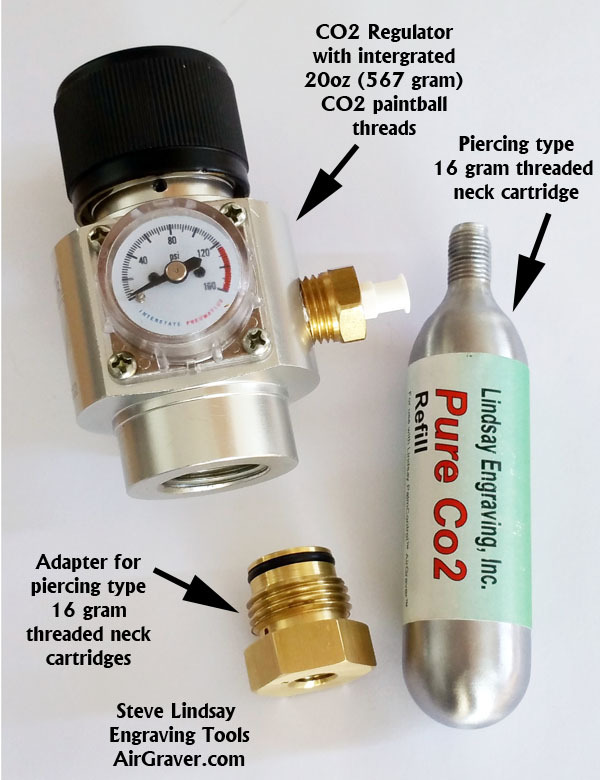 The optional tungsten dead blow piston allows greater top end power. 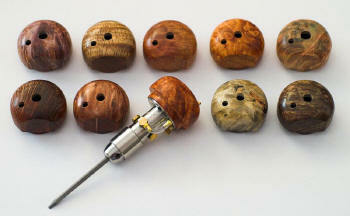 The tool is equally proficient at bright cutting and stone setting. 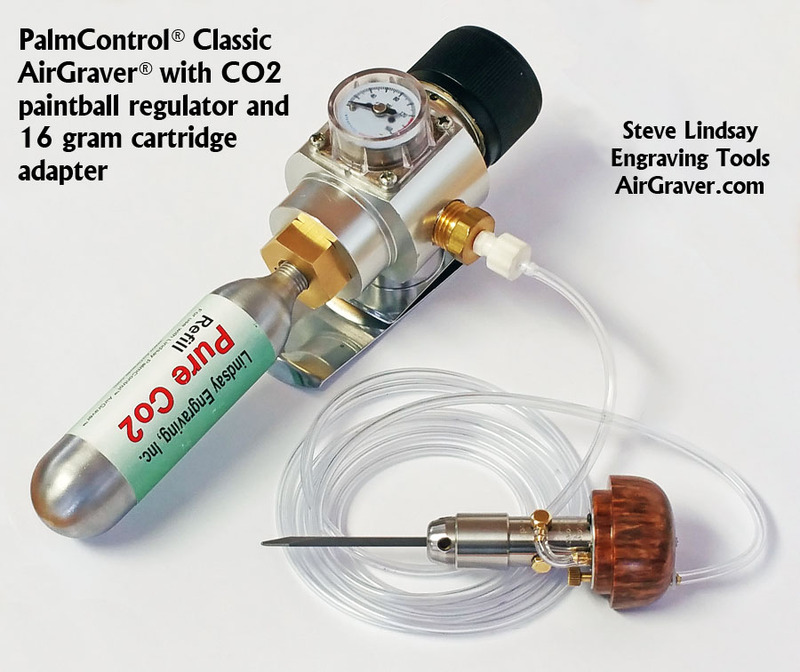 It requires 60 PSI regulated compressed air from either an air compressor or a CO2 cartridge. No electrical connection is needed. 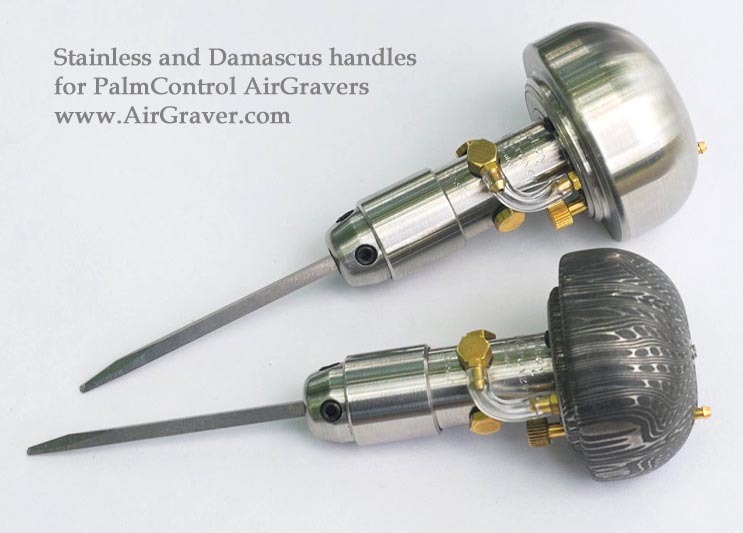 PalmControl® AirGravers are protected by patents and patents pending. 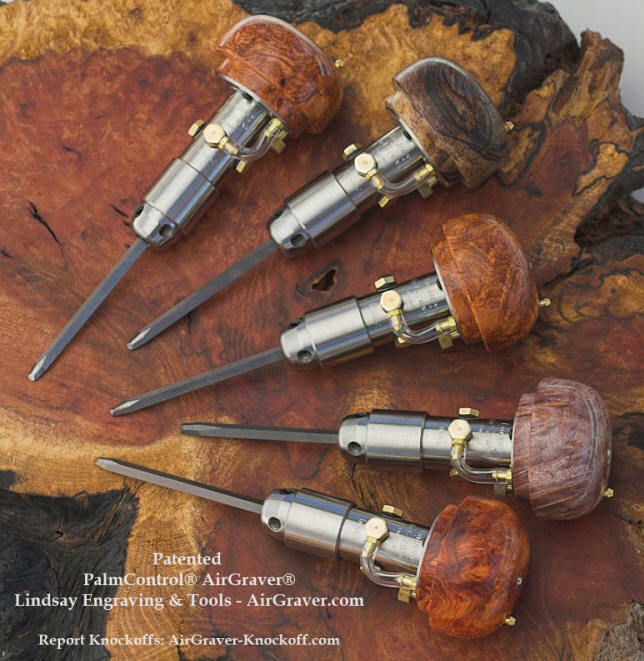 Lindsay gravers are made form surgical stainless steel. No aluminum is used in the construction of the tool. Using the PalmControl® involves the same technique as palm push engraving. 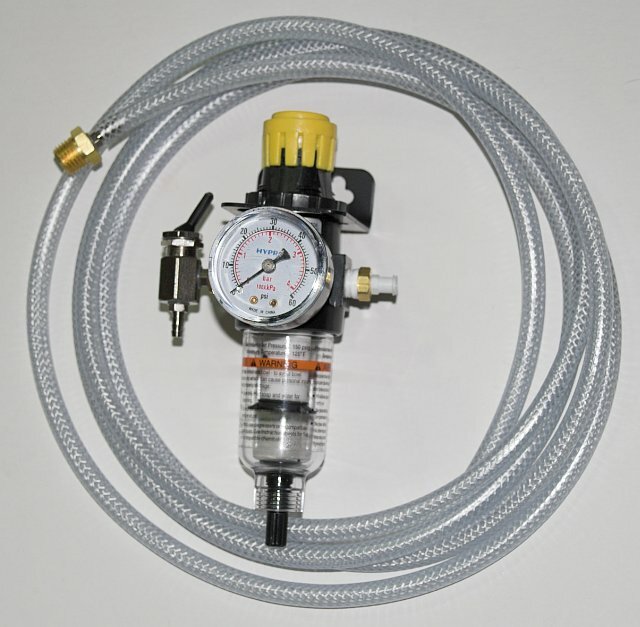 It is not necessary to push any harder than with the normal pressure used to hold a point snug in a cut with a foot pedal AirGraver®. The PalmControl® has an adjustment for users to set to the amount palm resistance that is felt, from light to heavy. The PalmControl® is instantaneous with its response time and can stop dead and break the chip out with a quick snap at the end of the cut. It can lay down a dozen short bursts of lines with ease and just as fast as a non-power tool. The Classic PalmControl® includes the handpiece itself, leather pouch, one presharpened carbalt graver, three HSS graver blanks, hex wrenches, spare orings, setscrews, thumbscrews, handpiece tubing and owner's manual. A stainless piston is included standard with the tool. A tungsten piston is also available separately. PalmControls generally ship in 10 to 15 working days.